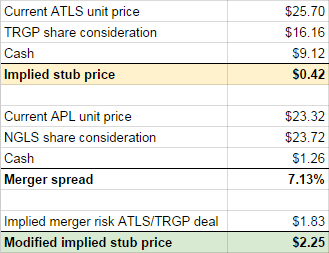 [merger spread * price(ATLS)]-9.12-TRGP share consideration? This looks interesting. Thank you. No position. Yes, that is how I calculated it. My sense is that ARP could credibly improve the ‘safety’ of its distributions and interest payments if it were to layer on significantly more nat gas hedges for 2017 and 2018, and to provide capital markets a bit more disclosure on the Partnership fee stream (and related items like how subordination of production revenue to investor partners within Drilling Partnerships, actually works — and associated commodity price sensitivity implications). I am not sure whether management is interested in doing either of these things though. Of course, there are other tools out there as well. Yes, copy/paste error in the value column, thanks for noticing. The per share numbers are correct (or at least were correct when I wrote this – lots of movement in all parts here). I have looked – or at least tried looking – into ARP. Not so sure that these units or the notes are a great deal, but it’s complicated to figure out expected cash flows. Cash flows will decrease significantly once hedges roll off and a lot of the (potential) value of ARP also goes to the GP and the preferred equity (also owned by new Atlas Energy, although it will automatically convert in 2016). I haven’t looked at the debt covenants in detail, but a potential risk I see is that the covenants aren’t restrictive enough and that the company can distribute a lot of cash flows to the GP and LPs. What’s left in 2021? The company’s reserve life index is in the neighborhood of 15 years, so even in an unlikely steady-state, there would be considerable reserves left for the notes in 2021. The prospect of ARP potentially paying out a ton of cash flow before 2021 is a bit troubling but endemic in the MLP world. Typically you’d expect the reserve base to continue to grow, and ARP to issue more debt, beyond 2021, as it does more acquisitions — and this loop itself is credit positive for those notes, allowing further acquisitions… But, the whole acquisition cycle gets gummed up when ARP’s debt and equity yield so much that it really can’t access capital markets. Atlas is a very interesting situation, but one that in practice is loaded up with quite a few different, subtle, risks. Very well stated. I am thinking about the situation similarly, but perhaps overthinking it a bit. In my mind the biggest risk is that the transaction doesn’t close. Are you comfortable being left with legacy ATLS/ARP and a short position in TRGP (which might even go up) in that state of the world? Comfortable is a big word: if the deal is cancelled I expect to lose money, but you are getting paid a decent amount of money right now to take that risk (although it is hard to quantify exactly since it depends on the value of the spin-off). Been long ATLS, short the TRGP to create Newco at my perception of attractive levels. I think toughest question is what happens to both stocks if the deal busts. Based on general TRGP analysts sentiment toward deal(very positive), significant accretion , and management recent statements I think the risk of a break is small. If the deal broke today, my best guess is ATLS trades to $27 and TRGP trades to $94. If this were right i make $5 X .1809($.90) on the TRGP short and lose $2.40 on each share of ATLS i’m long. Would welcome any other views on this “dealbreak”, which I realize has a large component of guesswork ?? My simplistic idea: the current spread between APL/NGLS is pretty big. So the market seems to think that either the probability of the deal being completed is very low or that the downside is very high (or a combination of both). If the market agrees with you that the probability that the deal will be completed is high it certainly won’t agree with you w.r.t. your downside estimates. Trying to understand today’s press release stating 70-80 cents of annual distribution. Is that per current ATLS share or is that for each share of the New Atlas, which would mean only 35-40 cents of annual distribution per current ATLS share. Their most recent filings showed $1.10 per current ATLS share, or $2.20 for the New Atlas. I wish the press release was more explicit in its explanation.